I’m a stay at home mom. Sometimes when people hear my job title I can see them cringe. I guess I’m considered the lowest of the low. I mean, after all, I wipe noses and bottoms, clean puke, attempt to clean the house, and receive zero pay. I’m even a stay at home homeschool mom which means that the giant yellow monster that screeches to a stop at the end of my street at 7:14 AM every morning does not rescue me from my children. Nope. I spend nearly every second of my day with them. I haven’t been able to run to the bathroom by myself for several years now. I also haven’t had a hot dinner in a very long time as mine is always cold by the time I serve the small army waiting for their food. I chose this job. Am I totally crazy? Many days I would say yes. I am certifiably nuts. I can barely have a coherent thought anymore. My dreams even rhyme in the cadence of a Dr. Seuss book. This brain is total mush. Much of society doesn’t seem to think I am making much of a contribution. It’s not like I’m attempting to raise the next generation. The cutting comments and the sideways glances can hurt. Sometimes I start to wonder if this stay at home gig is worth doing. I rarely make it out of pjs on many days. I never conquer the house cleaning, laundry mountain, or dish pile. It’s easy to become discouraged and question why I even stay at home. 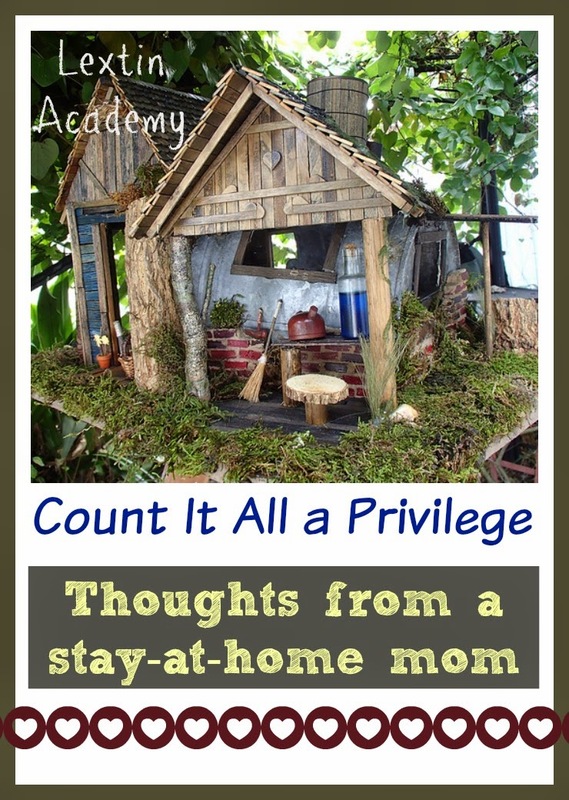 The ability to stay at home with my kids is a privilege so I’m told by many. I look around at the messy house, crying kids, and snot-stained pj pants and try to hold myself together. A privilege? Yes, it is a privilege. Even though this is by far the hardest task I’ve ever attempted to accomplish, I would still choose it. I choose the messy house, the never ending laundry, the unwashed hair, the committee that joins me in the bathroom, the Dr. Seuss stories, the diapers, and the constant juggling act of trying to maintain some form of sanity amidst the chaos. There are moments when I stand back and watch my kids and thrill at the thought that I get to spend time with them. There are moments that I would ache to miss. In those moments my heart is reminded that my job is a privilege; I do matter; and I’m not wasting my time, talents, and energy. I had one of those epiphany moments today. It was naptime for my youngest and I was trying to get some dishes done before I put her to bed. I asked her to go choose her books to read while I finished. When I slipped into her room I saw my 3-year-old in a pink sparkly princess cape sitting on the floor with a stack of board books next to her. 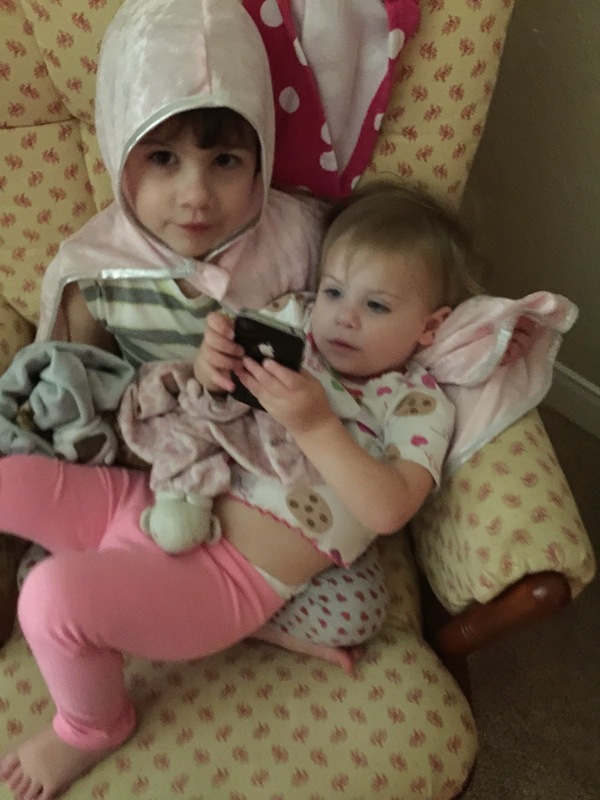 My little 2-year-old was sitting right next to her big sister looking at the books with rapt attention while her older sister “read” them to her. They put their heads together and giggled as they opened the flaps together. I stepped back out of the room and caught my breath. I didn’t have to miss that moment. And it’s those moments that help me through the challenging days (of which there are many). It is a wonderful thing to stay home and I’m thankful for all the times when my kids unknowingly remind me to count it all a privilege.